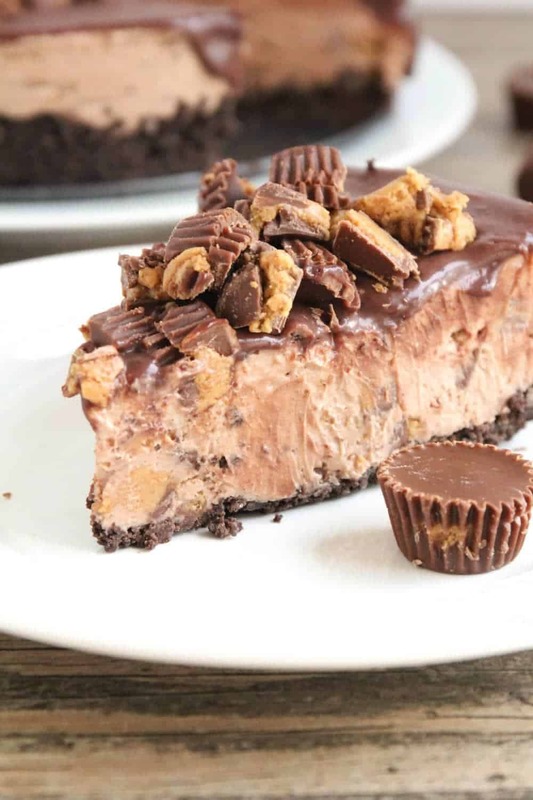 Reese’s No Bake Chocolate Peanut Butter Cheesecake – the perfect combination of creamy, rich cheesecake and the chocolate peanut butter of Reese’s! 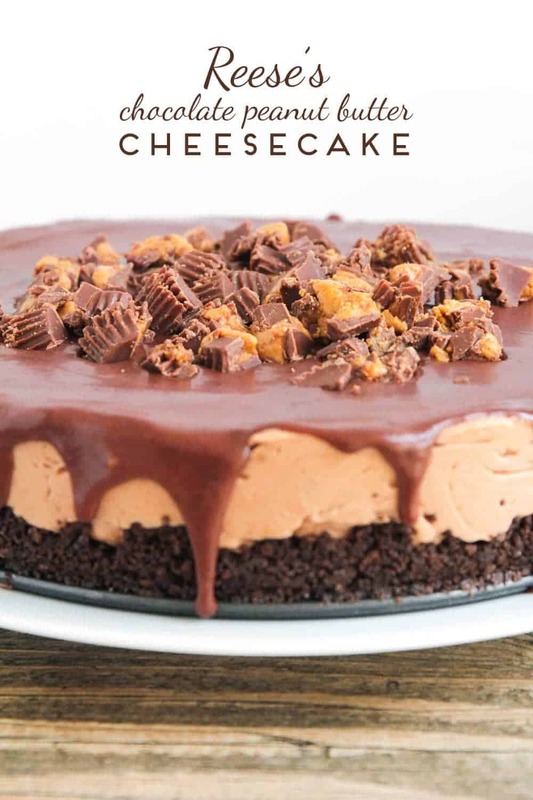 If you, like me, have wondered if there is anything better in the world than cheesecake, the answer is… this Reese’s chocolate peanut butter cheesecake! It has all the creaminess and deliciousness of cheesecake, but with the added chocolate peanut butter flavor of Reese’s! 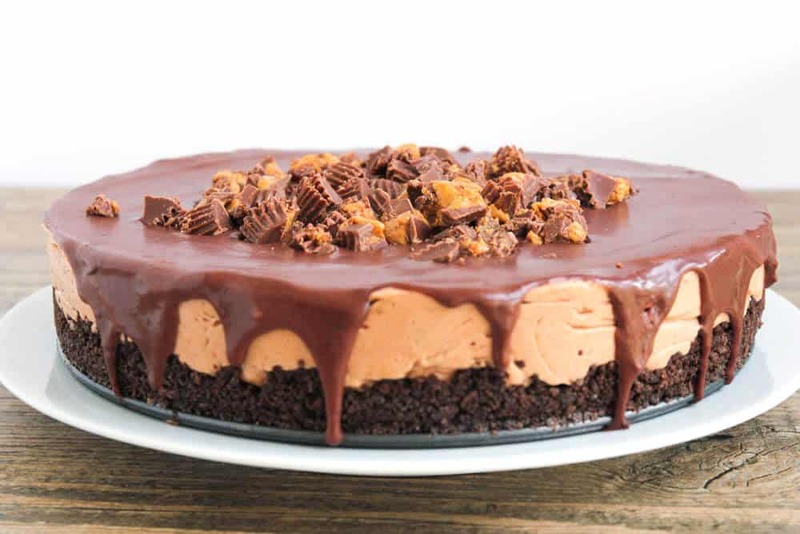 Cream cheese and Reese’s spread combine to form a smooth, silky cheesecake, studded with chopped Reese’s cups and topped with a rich chocolate ganache. It’s gorgeous and impressive, but surprisingly easy to make. You start with a chocolate graham cracker base. I like to use my food processor, but a plastic bag with a rolling pin works just fine too. You want the crumbs to be fairly fine, but it’s okay if they’re not all exactly the same size. 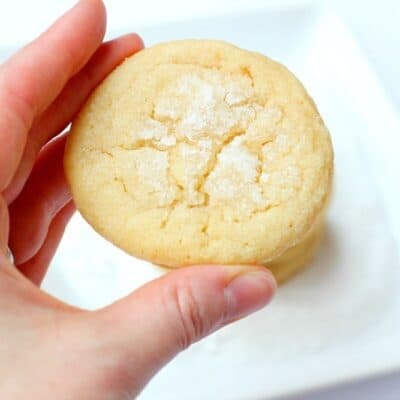 Mix the crumbs with the butter to make a mixture with the texture of damp sand, then press it into a springform pan and pop it in the freezer to firm up while you make the filling. The filling is quick and easy to whip up, with just a few simple ingredients. My favorite part is chopping up and mixing in the Reese’s peanut butter cups. The more the better! Once the cheesecake has chilled and firmed, it’s topped with a gorgeous and luscious ganache. 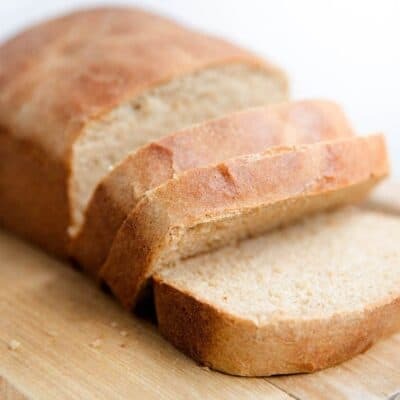 I’m always amazed that you can make something so delicious with just two ingredients! When the ganache has cooled, it’s ready to serve. Just take a look at this gorgeous cheesecake! It tastes as good as it looks, and is the perfect smooth blend of chocolate and peanut butter, with a delicious cheesecake flavor. 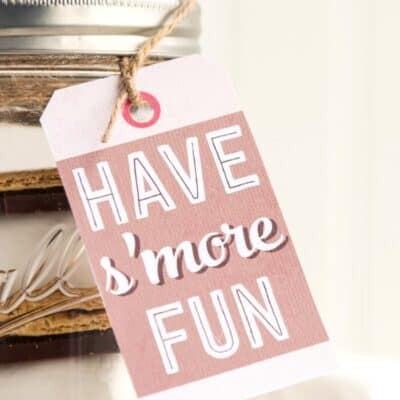 Whether you’re enjoying it with family or serving it at a dinner party with friends, it is sure to impress! 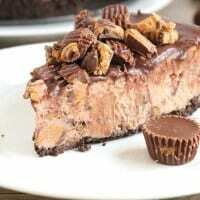 Reese's No Bake Chocolate Peanut Butter Cheesecake - the perfect combination of creamy, rich cheesecake and the chocolate peanut butter of Reese's! 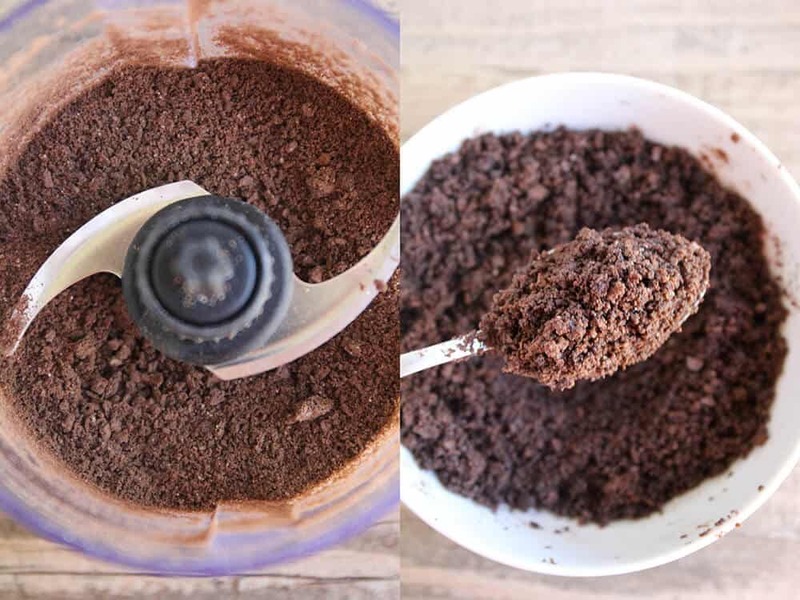 To make the crust, crush the graham crackers using a food processor. 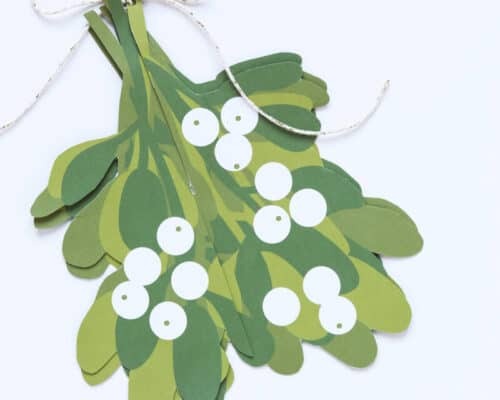 (You could also crush them in a plastic bag with a rolling pin.) Mix the graham crackers with the melted butter and press the mixture into a 9 inch springform pan or 9 inch pie plate. Place the crust in the freezer to firm while you make the filling. 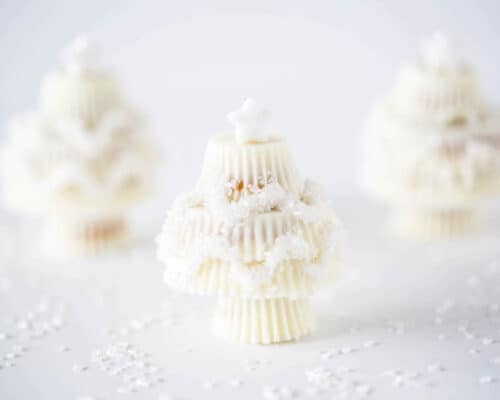 To make the filling, whip the whipping cream until light and fluffy, then beat in 2 teaspoons of sugar. Set aside. Add the cream cheese to a large bowl or the bowl of a stand mixer and beat until light and fluffy. Add the sugar, Reese’s spread, and vanilla, and mix until smooth. Using a spatula, fold in the whipped cream until combined. Add the Reese’s cups and fold in gently to distribute the candy throughout. Pour the filling mixture into the crust and spread evenly. Freeze 2+ hours or refrigerate 4+ hours, until firm. When the cheesecake is firm, make the ganache topping by adding the chocolate chips to a heat-proof bowl. 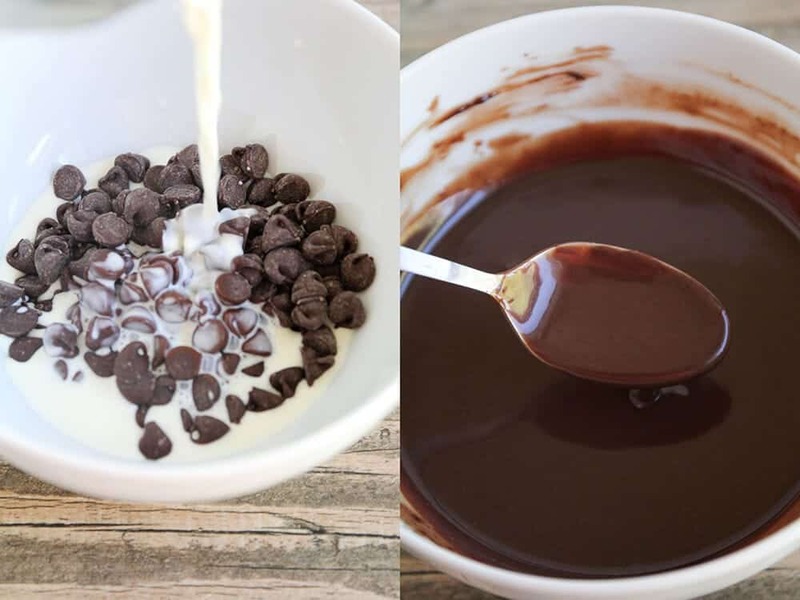 Heat the cream in a microwave safe bowl (I used a 2 cup measuring cup) until boiling, then pour over the chocolate chips. Let sit for a few minutes, then stir until the chocolate is melted and the ganache is smooth. Allow to cool for a few minutes, then pour over the cheesecake, using an offset spatula or a knife to smooth. Sprinkle the chopped Reese’s peanut butter cups on the top of the cheesecake. Return the cheesecake to the refrigerator or freezer for 30 minutes, or until the ganache has cooled and firmed. This cheese cake looks amazing! 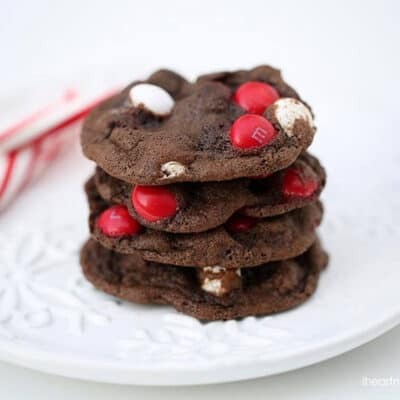 I love anything with chocolate and peanut butter.